Happy April! Although I'm not sure that New York would say the same. It has been a rough start to spring here in the Northeast, with temperatures remaining reminiscent of those back in December. Today I'm dropping in with a quick outfit post for those of you who are still experiencing winter's leftovers. To be honest, I am more than ready to store away my heavy coats and chunky layers. There are breezy dresses in my closet just waiting to be worn. For the time being, I've brought out my blue jeans and faux snakeskin booties to bring some life to my over worn winter wardrobe. Let's hope this touch of freshness signals some true springtime weather! Yeah april is always full of changes. Beautiful coat my dear! Love! 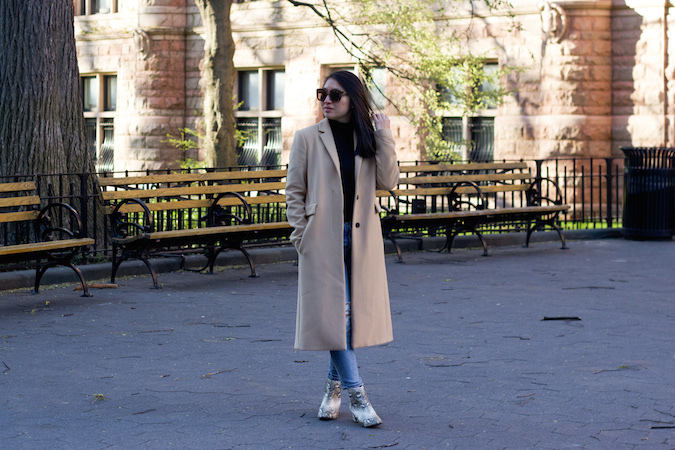 I've been seeing the long coats popping up everywhere~ very chic! 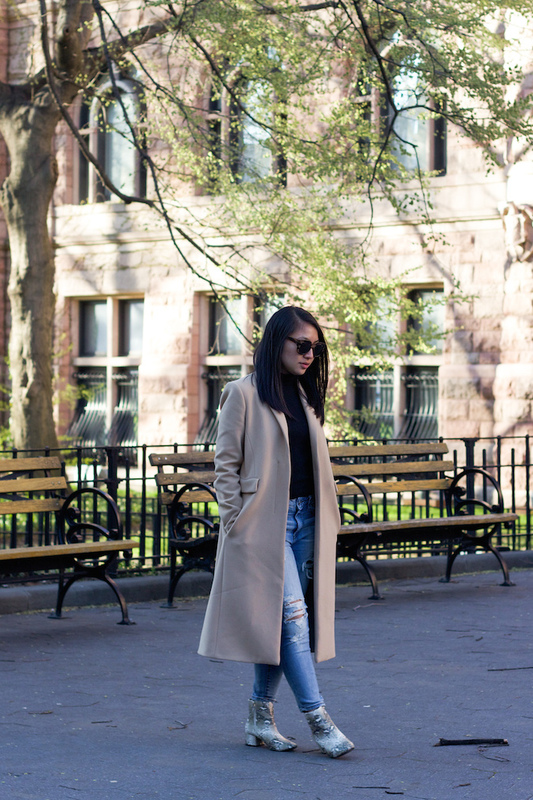 Love this long trench on you, against the denim! Gorgeous look! Thank you! Although I do want to put my coat away already, haha! It's still really wintery here in the UK too, loving the look though and if there's excuse to continue wearing camel coats then it's not all bad! Haha, I guess that is true!! i hear ya on the winter leftover weather!! we literally just had snow today! aaackk!!! you're totally killing it though with that coat! Hope spring weather comes soon for you! Regardless, you look so great in that coat! I'm in love with those boots an they go beautifully with that coat. Gorgeous Coat ! So stunning. I am too excited for spring!! dying over this look! those booties and that coat are the perfect combination! I cannot wait for spring!!! Those boots are so pretty :) Loving this look! I think winter is staying for too long too! Love this outfit though, especially those shoes! That is a one killer boats. I love how laid back chic this outfit is. Such a chic look. Love your outfit combination especially that booties!